Northern Illinois University biology professor Karen Samonds is looking forward this summer to reconnecting with old friends in a sunny place close to her heart. She also is looking forward to reconnecting with a new friend, Bob. Nearly a year ago, she left him hanging off a cliff—literally. While the dark, circular variations in the rock may not look like much, they are the fossilized ribs of Bob, the remains of a sea cow NIU professor Karen Samonds discovered last summer in Madagascar. Bob is a partial skeleton of a sea cow, a prehistoric predecessor of the manatee that Samonds and her crew discovered last summer during her annual research trip to Madagascar. Samonds’ field research aims to shed light on the origin and evolutionary history of Madagascar’s modern fauna. In addition to being funded by three National Geographic Research and Exploration grants, the research has drawn the attention of a film crew. In June 2013, Samonds was filmed for a documentary series titled, “Voyage of the Continents.” It depicts how, over many millennia, geology and evolution have interacted to forge life on Earth as we know it. Featuring her research and paleontology team, the camera crew visited two of Samonds’ fossil sites, and filmed for five days in northwestern Madagascar. The French version of the episode aired in Europe last year, while the English version is planned to air in the United States in late 2015 on the Discovery Channel. Samonds can trace her love for the fourth largest island in the world back to graduate school. 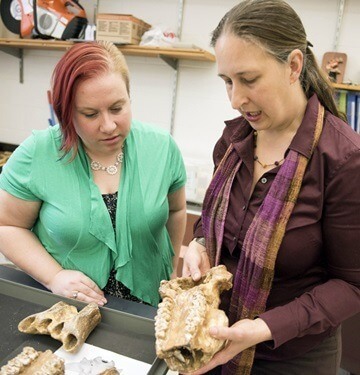 Graduate student Katie Heffernan (left) and Karen Samonds discuss the intricacies of a hippopotamus jaw discovered during one of Samonds’ research trips to Madagascar. It’s largely unknown how and when the island’s animals arrived in Madagascar, which split from India about 88 million years ago and became an isolated island. Samonds said many of the country’s current species arrived later, but a gap exists in the fossil record—from about 80 million to 80,000 years ago. Samonds has started to elucidate portions of this unknown period of Madagascar’s history by traveling to remote and unexplored regions of the island and by collecting and describing some of the first fossils from this time period. In more than 20 years of researching Malagasy vertebrate species, she has discovered more than 30 fossil-producing sites and found the remains of fish, sharks, crocodiles, turtles and even the first marine fossil mammal from the period. While many of her discoveries have been marine organisms, the fact that her team is also finding land-dwelling animals, such as bats and lizards, has been the most significant contribution to date. During fieldwork, her discoveries are assigned field numbers, packaged and weighed on location. 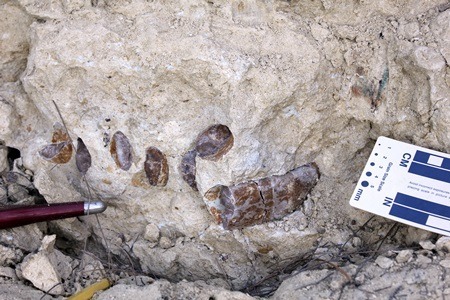 Some fossils are collected from the surface while others are encased in rock, requiring preparation with tools or an acetic acid bath back in the lab. “Out in the field, without electricity or running water, even seemingly simple tasks can be a big challenge,” Samonds said. 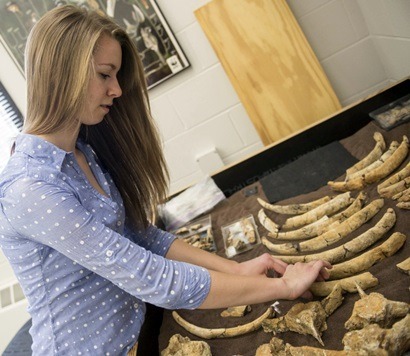 Freshman Jessica Cox, who is mentored by Samonds as a Research Rookie, works with fossilized bones uncovered during previous trips to conduct research of her own. Half of the specimens she collects stay in Madagascar. The other half of the specimens are transported to NIU, where they provide graduate and undergraduate students valuable research opportunities. NIU students are involved in fossil preparation, cataloging and examining specimens under a microscope. 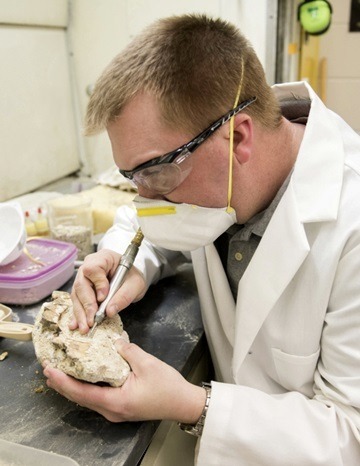 Graduate student Joshua Mathews removes rock deposits from a specimen. Some students even make their own discoveries. “The first bat fossils were discovered by NIU undergraduate student Samantha Kraft, who was working for research credit in my lab,” Samonds said. While most of her undergraduate researchers are juniors or seniors, Samonds has her first Research Rookie, freshman Jessica Cox, who is working with fossils her mentor collected out in the field. 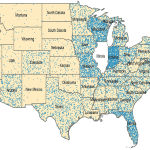 In the past, Samonds’ work has been confined to two specific regions. During this summer’s six-week expedition, Samonds and her team, including husband and NIU anthropology professor Mitch Irwin, will explore two new regions on the island’s west coast using GPS, GIS and satellite imagery. The biggest challenge she faces is juggling old sites that have produced yields with the need to discover new sites that could yield even more significant results. When scouting new sites, technology is critical. 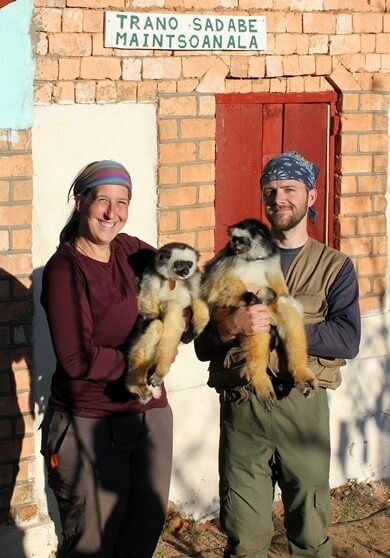 NIU’s Karen Samonds and Mitch Irwin helped found Sadabe, an NGO developing innovative ways to promote the healthy coexistence of humans and wildlife in Madagascar. “You can take satellite pictures of land cover and, by peeling back the layers of forest and grasslands, make choices about where you want to concentrate your efforts,” she said. After Samonds and her students catalog and study the specimens, many will eventually be housed into the collections at Chicago’s Field Museum or at another museum in the United States. “Fossils belong in an accessible public facility for scientific study and education,” Samonds said, adding that crocodile fossils she discovered are currently on exhibit at the Bruce Museum in Connecticut. But there’s more to Samonds’ work than research and excavation. She’s giving back to the local areas where she works. Samonds and her husband co-founded the non-governmental organization Sadabe in 2008 to help promote the coexistence of people and wildlife in Madagascar. Sadabe is currently initiating and expanding education, healthcare, conservation and sustainability activities, as well as the creation of a protected area at Tsinjoarivo, Madagascar. Having traveled to the area every year since 1998, Samonds is acclimated to the island, despite the challenges of health risks and cultural rules.